Recently, I raved about how much I loved Escape from Mr. Lemoncello’s Library, and guess what — you all let me down. Why didn’t any of you tell me that since I enjoyed that book so much, I should immediately go out and get The Gollywhopper Games by Jody Feldman? You guys! You gotta tell me these things! Luckily, I found the book for myself. And it’s exactly what I wanted: Kids competing against each other — but in a safe and lighthearted way, not like the horror of The Hunger Games. And word puzzles, lots and lots of word puzzles. 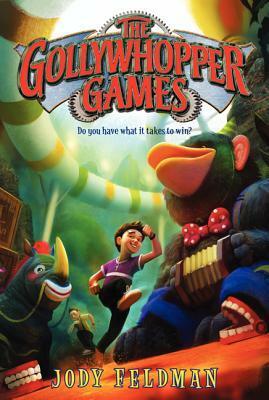 In The Gollywhopper Games, Gil Goodson enters an epic competition being held by the world’s most successful toy company. The prizes include tons of toys and money, but Gil is in it for a more personal reason: If he wins, his family will move to a different town — and Gil desperately wants to leave, ever since his father was wrongfully accused of stealing money from his job and all Gil’s former friends have turned their backs on him. One complication: Gil’s dad used to work for the Golly Toy & Game Company. So not only does Gil need to worry about solving all the puzzles and beating all his competitors, but the company running the whole event doesn’t want him to participate at all. Can Gil triumph in the face of these challenges? He’s going to try! Of course, I’d recommend this book for fans of Escape from Mr. Lemoncello’s Library. And just like that book, The Gollywhopper Games will also appeal to you if you enjoyed The Puzzling World of Winston Breen, Jeremy Fink and the Meaning of Life, The Candymakers, or Floors. And once you finish The Gollywhopper Games, there are two more books in the series: The New Champion and Friend or Foe. I haven’t read them myself yet, but I wanted to tell you about them anyway, because hello — we tell each other about books to check out, right? Right?! If you’ve read any of the Gollywhopper Games series, or if you have other books you want to recommend so I don’t yell at you again, please leave a comment below! This sounds like an interesting book! I will make sure to check it out. I really enjoyed Mr. Lemoncello’s Library also. There is another book by the author of it (I can’t remember his name) that is called something along the lines of The Mysterious Island. (I can’t remember the name of it either. Jeez! What can I remember!) Anyway, the main character’s name is Billy, and, well, I don’t want to give it away, but the books sort of come alive. That’s all I will say.